Like many design studios, our team uses Adobe Creative Cloud across our studio. Most of our work is created in Illustrator or InDesign, which our design team uses to customize pieces for made-to-order fabrication live on-site. Adobe approached us to design interactives for their Creative Jam event series and we were thrilled to dive deeper into how Cloud can be used for live experiences. Abobe’s Creative Jams are held in a hundred cities and are part competition, speaker series and portfolio review. At each event, a group of designers compete in a short hackathon to create new apps on Adobe XD. While they’re working away, a few hundred more designers can catch a speaker series, have their portfolio reviewed, and network with like minded peers — which is where we come in. To help inspire the creative minds in the room, Adobe asked us to provide interactives across the country — in Boston, New York, San Francisco, Salt Lake City, and San Diego. The challenge for our team was to create authentic design experiences for design communities across the States. We’re sometimes seen as a laser and 3D printer rental company, but designing a bespoke creative series takes much more comprehensive capabilities. We worked with Adobe’s events team to curate interactives that had a brand-relevant through-line, while respecting three key parameters: incorporating work from local designers, ensuring a hands-on design experience, and utilizing wildly disparate creative tools. Planning an entire series at once also allowed our production team to show off their killer logistical skills. While the team’s gotten great at shipping laser cutters, 3D printers, and digital graffiti walls for one-off events, plotting out a whole series at once let them save a ton of time and cost. 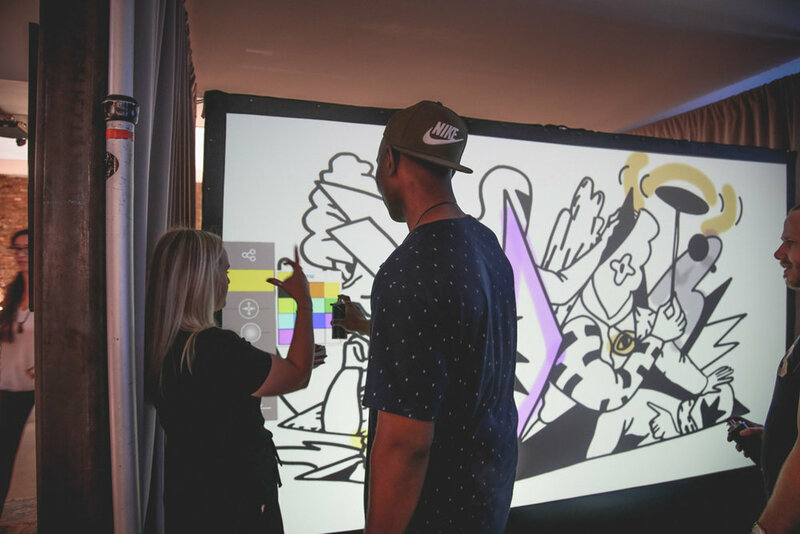 In New York, Boston, and San Diego, we used work that was submitted from the local design community to create colouring book pages on our giant digital graffiti wall. Guests coloured, collaborated, and customized those pieces using digital graffiti canisters. In San Francisco, guests created one-of-a-kind totes by choosing fonts, slicing up vinyl prints, and heat-pressing them into gorgeous bags. We brought our laser cutter to Salt Lake City, where we were live customizing and fabricating bowties and pendants, laser sliced and engraved to order. As creative director I don’t always get to attend our events personally, and it was great to join our events team in San Francisco and Salt Lake City. It was also super fun to see how our interactives work with a 100% designer demographic :). At MakeLab we joke that we often design three different creative experiences for any one event, depending on the skill (and inebriation level) of any given guest. It’s important that anyone can design something that looks great in just a few minutes, and we put in a lot of advance workflow and template building to ensure that happens. At Creative Jams, the average skill in the room is insanely high, and the kind of work that came out was great. It was impressive to see the general instinct among designers to take creative risks and to design outside of our preset parameters. It was fun to see the thrill when their lasered, pressed, or spray painted items came out different than expected, but somehow always awesome. Back in Toronto after the Creative Jam series, I’m seeing our development team reach deeper into what our tools can do, and build live-fabrication experiences that allow for more creative freedom. I think everyone has a natural born instinct to be creative, and when given new opportunity, new tools, and encouragement to experiment, it’s impressive to see what can be made in just a few minutes. We spend a lot of time at the studio re-imagining how tools can be used in new creative ways. Our team is really excited for new creative projects and if you’ve got one in mind, we’re always up for a challenge.